Formulated as a low molecular weight synthetic resin varnish, Gamvar has a refractive index similar to dammar natural resin varnish. Gamvar can safely be used sooner than other varnishes. 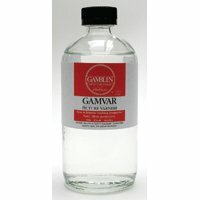 Gamvar's mild solvent will not dissolve the glaze layers of paintings. Does not yellow and remains easy to remove. Goes on water-clear and gives great depth, intensity of color, and a protective semi-gloss surface. Covers about 320 square feet. If you have any questions about this product by Gamblin, contact us by completing and submitting the form below. If you are looking for a specif part number, please include it with your message.